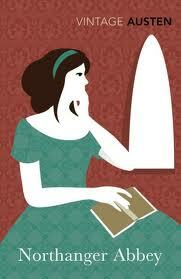 I have a confession: until a few days ago, I had never finished a Jane Austen book. I’ve started several over the years, but I always put them down with no inkling to try again. So when Northanger Abbey fell into my lap a few months ago, I had low expectations. However, I found a charming, funny novel with a clear and clever author’s voice. The book, as you can guess, is set in Austen’s England. It centers around Catherine, a young lady who travels to Bath for the first time with family friends. While there, she meets a cast of friends who are must more sophisticated than she in the ways of society, but she manages to hold her own, develop friendships, romances and generally entangle herself in life at Bath. Later in the novel she travels with some of her new friends to their Northanger Abbey. Although Catherine is sweet, kind, polite, etc., she is completely endearing for, not in spite of, her simplicity. She loves reading novels, and her imagination easily gets the best of her on several occasions. She’s very honest, and she expects the same in others, sometimes to a fault. However, by the end of the novel, when you see Catherine back with her family, you see how much she has grown up during the book. Additionally, the hero of the book, Henry, is funny and clever, and he calls Catherine out on some of her ignorance while remaining a complete gentleman the entire time. The layering of mystery about Henry and his family lends itself a sense of dark mystery, but as each small question is answered and dismissed, I felt myself continuing suspicion, which made it that much more dramatic when each new question arose. If I had one complaint, it would be that Henry’s sister is written somewhat flatly throughout the entire novel. She and Catherine become quite good friends, but besides being thoughtful, kind, caring, understanding… everything positive, the reader barely gets to know her. Although she helped the plot progress, she felt like a place holder for a more dynamic character Austen had yet to dream up. From the first chapter, I had a hard time putting this book down. It was a great lunch hour read, when I could devour a few chapters and then be ready to come back to the present. I will certainly be searching out some more Jane Austen and give her another try.